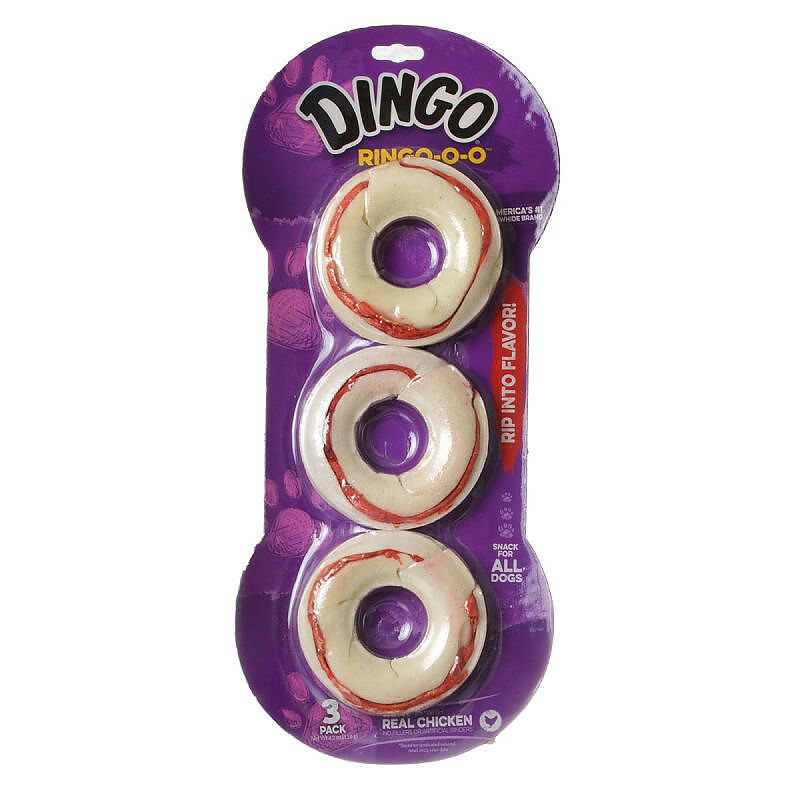 Dingo Ringo-O-O Meat & Rawhide Chews are irresistable real chicken breasts rolled in natural rawhide in a novel ring shape. Dingo Ringo gives your dog a healthy & fun way to exercise and clean their teeth. Dingo Rawhide chews are made with the highest quality ingredients to give your dog a delicious treat that dogs love! 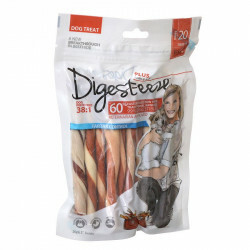 Ingredients: Rawhide, Chicken, Pork, Water, Dextrose, Salt, Potassium Sorbate (preservative), FD&C Red 40. These are my dog's favorite chews. He runs to the jar every morning and barks for one. I think they are the safest because they do not break apart into pieces and he can chew on them for many hours. MY TWO LITTLE GIRLS, 8# & 10# JUST LOVE THESE. IT KEEPS THEM OCCUPIED FOR HOURS, EVEN TAKING THEM TO BED WITH ME, SO THAT I GET THE FULL FEELING OF THESE.I AM GLAD TO BE ABLE TO PURCHASE THESE FOR THEM, AND THE SERVICE IS GREAT. My dog has been eating this for years. My 175 lb GS has one before bed every day. He will let me know if I forget.The best prices are here. Ringos, my dogs love them! I used to be able to purchase these rawhides at my local pet store, but they discontinued carrying them. I was overjoyed when I saw I could order them through Pet Mountain, and at a %50 savings. Me and my dog are happy, happy!! 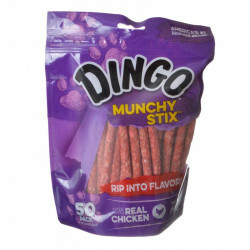 Enthusiastic Dachshund Loves the Dingo Ringo-O-O Meat Chews! I am now buying these in bulk as it is the ONLY chew treat that takes at least an hour for them to eat (and it keeps my dachshund from chewing the furniture, etc.) Very happy. Great price. My dauhound loves these. 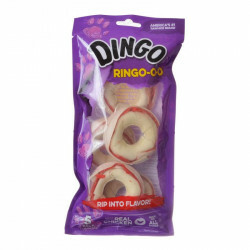 Discovered "Ringo Dingos" last year and my local store stopped stocking them. Yeah! PetMountain has them. Affordable and delicious. My basset and cocker settle in and enjoy while I get to have my coffee. My dog loves these rings. She likes that she can chew on it from many angles. My dog is a serious chewer and he really likes these chews. I recommend these to all chewer dogs! My 2 cockers LOVE their DINGOS!! They are so spoiled that anytime someone comes to the house, they lead the way to the Dingo closet. They know how to behave! By chewing on a Ringo! Have a doodle and a poodle... both simply love the Ringo Dingos... their favorite Dingo chew... in fact... their favorite chew treat period! 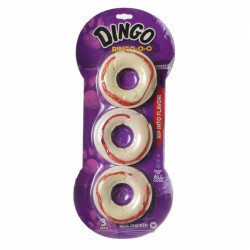 Dingo treats are what my three dogs enjoy the most. I have visited many Web sites to find the lowest price on dingo products, and found that Pet Mountain have the best prices. I have two dogs who look forward to these treats every night. My dog loves to chew, but he's very selective! Dingo Ringos are the only product I've found that he is consistently interested in. He's chews on them every day, and consequently he has very clean teeth. I have 7 small dogs. Since I learned years ago from my veterinarian that small dogs tend to be more prone to dental problems, I did my homework to find the best rawhide that had a taste they would like, but would be brushing their teeth at the same time. My oldest dog, a Shihpoo, Millie, is 8 years old. The vet is amazed at how great her teeth look. All thanks to Dingo Ringos and the entire Dingo Brand of chew treats.